The 2014 WSOP Main Event champ, Martin Jacobson, has just been named as the latest Player of the Year by Poker.se. The Swede, who overcame more than 6,000 players to bank $10 million last year, managed to trump the likes of Viktor 'Isildur1' Blom, Chris Bjorin and Robin Ylitalo, to claim the Swedish title. According to the stats, Jacobson's victory at the fourth time of asking was a veritable landslide after he captured 80% of the votes. The MTT expert, who managed to score two six-figure cashes at the 2015 Aussie Millions, also won the company's Poker Ambassador award with more than twice the amount of votes as the runner-up, Simon Lindell. Jacobson has long been considered one of the top tournament grinders in Europe as well as an excellent representative for Swedish poker, but it wasn't until his victory at the 2014 WSOP that the poker world at large took notice. Since that time he's not only carried himself like a pro on the felt but helped promote poker in both his home country and across many part of Europe and the US. Commenting on his latest accolade, Jacobson told PokerNews that his aim is to represent the game as positively as possible and encourage more people to ante-up. "It is of course a great honour to be voted not only the Swedish Player of the Year but also first choice as Sweden's Poker Ambassador. My goal is to live up to the expectations by representing poker in the best way possible and hopefully encourage more people to become aware of this incredible game," said Jacobson. Although he hasn't yet confirmed his attendance, it's likely Jacobson will be at the next Unibet stop in Copenhagen. 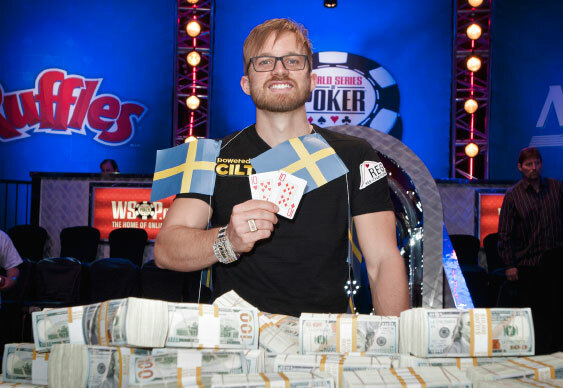 Before his WSOP Main Event win the Swede had long been a supporter of the tour and could be ready to ante-up when the action kicks off on February 26. Join him in the Danish capital for just €1 via the special St Valentine's Day satellite.